Metal Magnet Board. 8x10 Line Minder w/ Magnetic Ruler  - $6.78 : Yarn Tree, Your wholesale source for cross stitch supplies. Item 2701. 8"x10" Magnetic Line Minder Board with 6" Magnetic Ruler. Indispensable item for all needleworkers. The metal board and magnetic strips allow you to keep your place on even the most detailed chart or graph. Its also great for knit and crochet patterns! 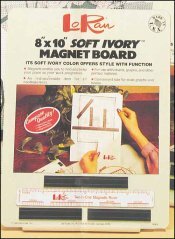 Soft ivory color board comes with several strip magnets in an attractive retail package.